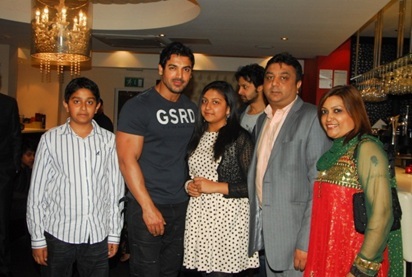 Bollywood actor and former model John Abraham paid a surprise visit to Chak 89 recently. Diners at the exclusive restaurant could not believe their eyes when they saw John mingling and posing for photographs. Born in 1972 the Indian film actor made his film debut with ‘Jism’ in 2003 which earned him a nomination at the Filmfare Best Debut Award. He then went on to star in commercial successes like ‘Dhoom’ in 2004 and then later ‘Water’ in 2005 and ‘Baabul’ in 2006. His most recent film was Desi Boyz where he starred as a desi college-student in London, opposite Deepika Padukone and Akshay Kumar. Chak89 are not only a top Indian restaurant in London, but are also perfect for all types of wedding celebrations and a great Indian wedding venue, they can accommodate and cater for up to 650 guests in two adjoining banquet halls. They are also perfect for business conferences, or can bring the CHAK89 experience to you by allowing their Indian catering to stage your special day at any venue of your choice. This press release was distributed by ResponseSource Press Release Wire on behalf of Chak89 in the following categories: Entertainment & Arts, Leisure & Hobbies, Food & Drink, for more information visit https://pressreleasewire.responsesource.com/about.